Personal style is a lot more important then most men think. It’s one of the first things people will notice about you, how you dress can define your characteristics and personality. To all the men out there – You don’t need to wear the same board shorts all summer. Fashion is something that can change everyday. Lets start with something simple. All men can look good in a basic white, black, striped or grey tee, essential in every mens wardrobe, as styled below. Printed shirts are a must for summer, slightly unbuttoned with a plain short or pant will work well. For casual day wear a plain tee and denim is effortless and will never go out of style. Simple yet so stylish. Ideal outfit for summer and neutral colours, styled with a brown belt. This look isn’t hard to put together, and simply by tucking in your tee and adding a belt can make all the difference. Business wear and office looks can be clean cut, while still have an edgy casual feel to them. Accessories are important, a staple pair of sunglasses, stylish shoe and watch can make all the difference. A classic appealing look for men. 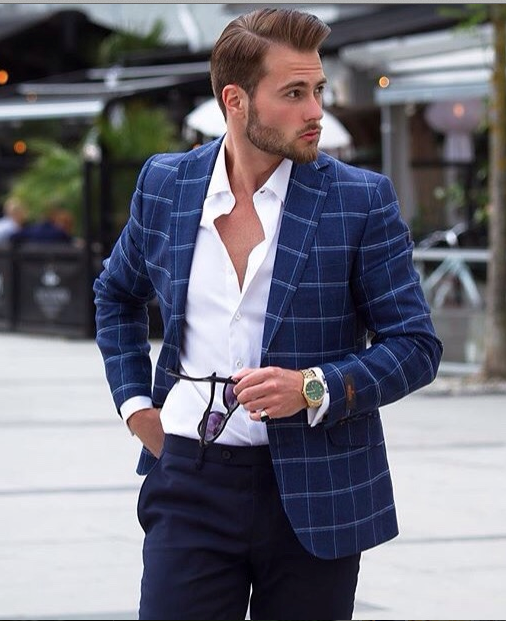 Blazer and a Navy pant, the white unbuttoned shirt makes the look more casual. Finished with a pair of sunglasses and this is a perfect mens summer fashion look. Weekend and sport fashion for men can be a lot of fun. Don’t hold back on wearing some colour and a flat hat as pictured below. 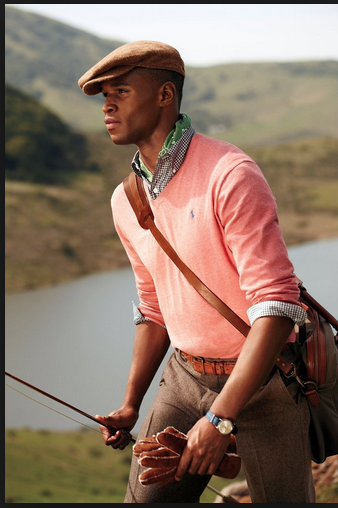 This fashion forward look is perfect for mens hobbies such as gold or fishing. Sporty yet stylish the flat cap is perfect for outdoors. The colour contrast between the pink and brown is timeless, a look that will never go out of date.